The Blogger’s Link Party Pit Stop is a great way to meet new bloggers and to gain more interaction on your own posts. 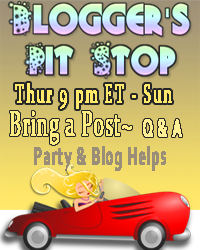 Blogger’s Pit Stop is open every Thursday from 6 pm PST through Sunday at 12 midnight PST. You join linkups to get comments on your posts!! ELISE a.k.a. Ask Dr. Ho – Dr. Ho is a CBD Entrepreneur and a Holistic Wellness Coach who helps women break through their limiting beliefs, overcome obstacles, and manifest their dreams. Her blog is known as “Ask Dr. Ho” because you can literally ask her anything. Click on the Banner to get your code to put on a post page or your party page. The FEATURES from the last Pit Stop.